This year marks not only the 30th year of the World Wide Web but also the 30th year of our Junior Developer Pav. In those 30 years, a lot has changed. Ignoring the wrinkles, the web has matured into a network of over 5 billion person, connecting friends, family and everything in between. 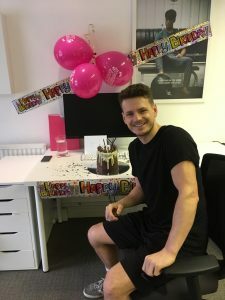 Chatting in the office today, our MD Mike recalled the first time he saw a web page back in 1993 while studying Graphic Design, ‘it was amazing, seeing artwork come alive on the screen was one thing back then, but to view a page created in California USA was another thing all together’. Things have come along way since that first introduction to the World Wide Web, today we use it to do anything from communicating with friends on social channels like Instagram, Facebook and Twitter, to purchasing last minute gifts for loved ones and having them delivered the very next day, amazing indeed! The internet (net) is a huge network of computers and servers all connected together, but it was the world wide web that made the technology into something that linked information together and made it accessible to everyone. Today it is not unusual to see generations young and old interacting with a device, updating profile pictures, or simply browsing to see what loved ones are doing. 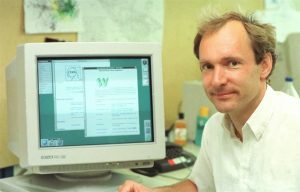 Berners-Lee created the world wide web while he was working at CERN, the European Organisation for Nuclear Research in Switzerland. His vision soon went above and beyond a network for scientists to share information, his vision was to create a universal and free ‘information space’ to share knowledge, to communicate, and to collaborate. The WWW was born! Koded Web exists today to service the digital needs of our clients, driven by the passionate people in the team who all share the love for the web and digital. We create outstanding websites and digital pieces to showcase products and services across the globe for our international clients such as Castore and Ping Golf etc. We are always keen to embrace the newest technologies as we believe the web is the future for not only Koded, but commerce and communication as a whole. Here’s to another 30 years, very exciting times ahead indeed.